The Ouija Board dates back to Pythagoras in 540 BCE. Messages from the spirit world were interpreted with his student Phlolaus. In 1853 the concept was refined by French spiritualist, M.Planchette. The board comprised of a large piece of paper, with a heart shaped wedge with two wheels at either end. The third end had a pencil attached. People would place their fingers on the wedge, which would form pictures or words. 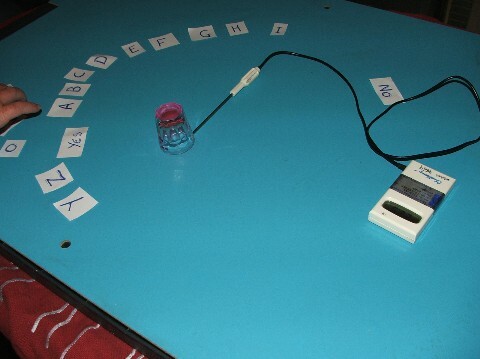 The modern board now comprises of numbers and letters, and a planchette is used as the indicator.The modern board was invented in 1892 by Elijia J Bond and William Fuld in Baltimore. In 1966 the Parker Brothers purchased all rights to the Ouija Board and sales have been second only to Monopoly in the USA. 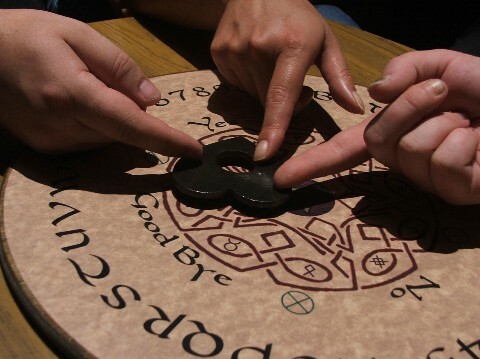 Some people use the board as a light hearted parlour game, however over the centuries it has caused considerable alarm with, some say its ability to contact and communicate with the spirit world. The board has become popular with many spirtualists and they claim that spirits can be contacted and channelled through the board. 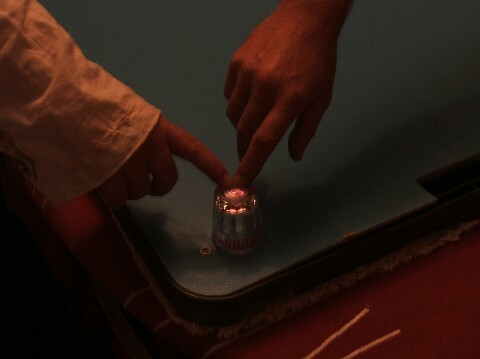 Pictures taken below are from an experiment at a members home. During this session considerable temperature changes were recorded on the base of the glass, to the top of the glass. This session was very active and when viewing all data after the session, we had recorded on two of our devices several strange voices that were not any of the team present. Further tests are being carried out and this page will be updated periodically. The Ouija Board has received a great deal of bad press over the years, this is partly due to teenagers tampering with something that they have no knowledge of. The board should not be treated as a game! Have you experimented with the board? We would be interested in your stories. Experiments have been undertaken by the team and have proven inconclusive.Therefore Ghost Connections have choosen not to use the board on investigations.